There really is not one single brand or style of climbing spur that has a stronger following than the Gecko Ultra Light climbers. Engineered in Germany to simply fit differently--as in better--than other popular spurs on the market. The design of these spurs is easier on the ankle and shin when compared to more traditional spurs. Additionally, there is no adjustment sleeve to add weight or bulk, yet these spurs do adjust easily at every 2 cm (adjustment range from 41 - 48 cm). The pads feature washable padding and are made from fiberglass, which really completes the lightweight package. The Velcro cinch straps are wide and secure, and eliminate the need for traditional upper leg straps. Most users of these spurs and pads agree that they are simply the lightest, most comfortable choice on the market. This spur setup is sleek, simple and very effective. 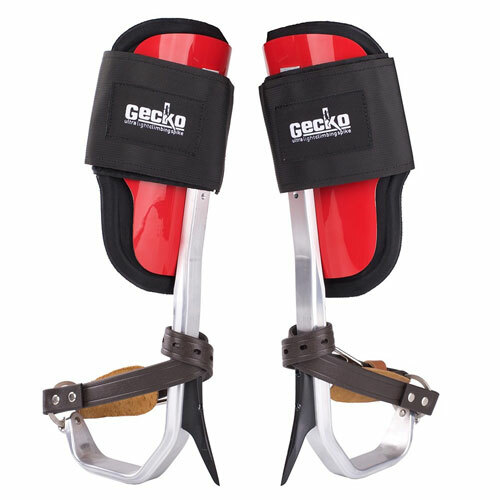 * Weight limit on Gecko climbers has recently been raised to 350 lbs, including gear. Is there any way to get these in a different color? My bf is an arborist and I wanted to get these for him for Christmas, but his boss has this exact pair in red. 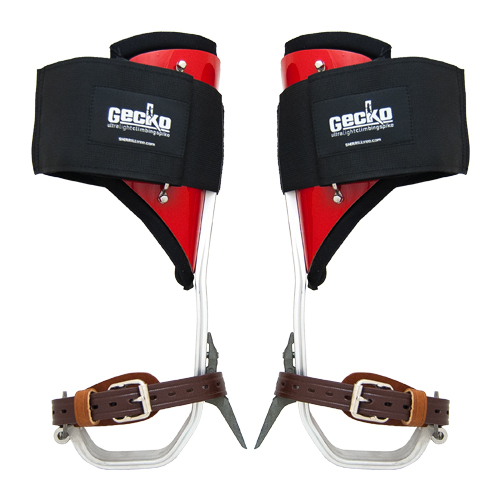 This exact SKU only comes as shown, but Gecko does offer carbon fiber spurs which are lighter and mainly black. You can see them here. Can I order a replacement calf support or what ever the red part is? Yes, we have this part on order and it should arrive in 5-7 business days. We can contact you at that time. How long are the spikes? The spikes/gaffs on these spurs are called out @ 2-7/8" in length. This is a fairly standard length for tree gaffs. Most will measure from 2-5/8" - 2-7/8". They worked for what I needed to get accomplished. Climbing a 40ft pine tree is not easy but the spikes worked out great. I would recommend them to anyone looking to trim trees and/or palms. Best pair of spurs I've ever owned, the design of these spurs fit your leg and foot beautifully, even if you're in the tree for hours at a time, no problem! The comfort level is unmatched. The spikes came in right on time and were just what I wanted. Thanks.